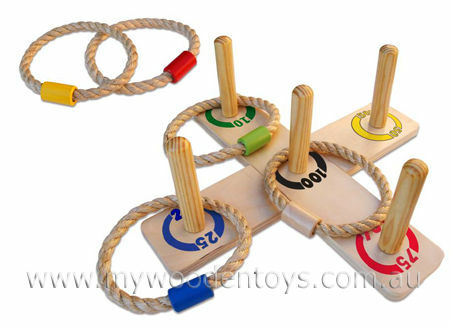 Wooden Classic Ring Toss Quoits is a traditional game where you try to accurately throw a circle of rope around an upright pole to gain points. This lovely wooden version is designed in a cross with five uprights and five rope rings with coloured wooden tags. This is a very solid game which can be played outdoors or carefully indoors. The rope rings (quoits) in this set are made with natural chunky brown rope.